Two men slain in a notoriously violent downtown park Friday night were involved in drug dealing and may have died protecting each other and their turf, those who knew the pair believe. Friends who identified one of the victims as Greg said he’d been supply-ing marijuana and crack cocaine to . 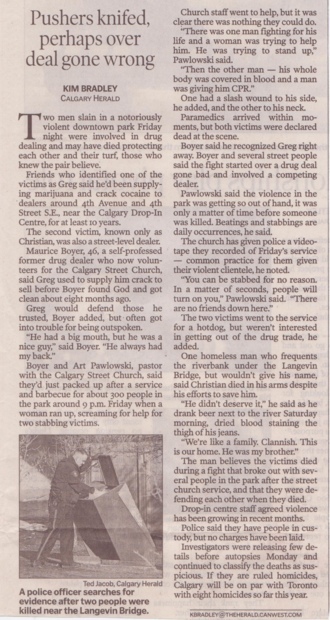 dealers around 4th Avenue and 4th Street S.E., near the Calgary Drop-In Centre, for at least 10 years. The second victim, known only as Christian, was also a street-level dealer. 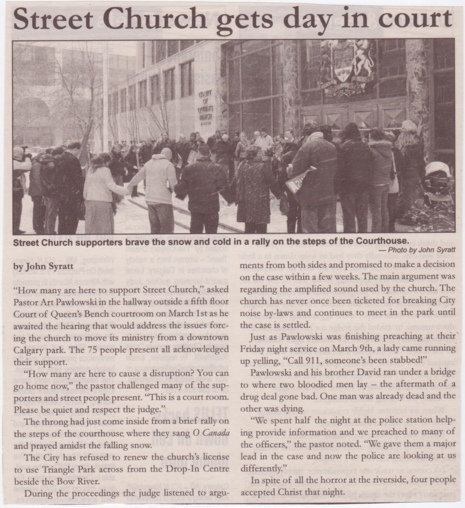 Maurice Boyer, 46, a self-professed former drug dealer who now volun¬teers for the Calgary Street Church, said Greg used to supply him crack to sell before Boyer found God and got clean about eight months ago. Greg would defend those he trusted, Boyer added, but often got into trouble for being outspoken. "He had a big mouth, but he was a nice guy," said Boyer. "He always had my back." Boyer and Art Pawlowski, pastor with the Calgary Street Church, said they’d just packed up after a service and barbecue for about 300 people in the park around 9 p.m. Friday when a woman ran up, screaming for help for two stabbing victims. Church staff went to help, but it was clear there was nothing they could do. "There was one man fighting for his life and a woman was trying to help him. He was trying to stand up," Pawlowski said. "Then the other man his whole body was covered in blood and a man was giving him CPR." One had a slash wound to his side, he added, and the other to his neck. Paramedics arrived within mo¬ments, but both victims were declared dead at the scene. Boyer said he recognized Greg right away. Boyer and several street people said the fight started over a drug deal gone bad and involved a competing dealer. Pawlowski said the violence in the park was getting so out of hand, it was only a matter of time before someone was killed. Beatings and stabbings are daily occurrences, he said. The church has given police a video¬tape they recorded of Friday’s service – common practice for them given their violent clientele, he noted. ”You can be stabbed for no reason. In a matter of seconds, people will turn on you," Pawlowski said. "There are no friends down here." The two victims went to the service for a hotdog, but weren’t interested in getting out of the drug trade, he added. One homeless man who frequents the riverbank under the Langevin Bridge, but wouldn’t give his name, said Christian died in his arms despite his efforts to save him. "He didn’t deserve it," he said as he drank beer next to the river Saturday morning, dried blood staining the thigh of his jeans. "We’re like a family. Clannish. This is our home. He was my brother." The man believes the victims died during a fight that broke out with sev-eral people in the park after the street church service, and that they were de-fending each other when they died. Drop-in centre staff agreed violence has been growing in recent months. Police said they have people in cus-tody, butno charges have been laid. Investigators were releasing few de-tails before autopsies Monday and continued to classify the deaths as sus-picious. If they are ruled homicides, Calgary will be on par with Toronto with eight homicides so far this year.